My knowledge of hamburgers goes beyond anything you could imagine, because I have been cooking the best burgers on campus for the past two years. The Deluxe Hamburger can be found across the street from Matt Knight Arena in Hamilton Complex. Just like each of the 800 students who call Hamilton home, this burger is always unique. Head chef Dan Irvin brought his experience to the university after working in the New Orleans fine-dining scene. To revamp the average burgers the school had been serving, he aimed to create a burger worthy of a five-star restaurant. No item was overlooked when Irvin designed the burger creation station. The one-third-pound burger patties are made from locally raised meat. There are 127 possible combinations of the seven sauces offered, which include a tangy BBQ and a creamy garlic aioli, both made in house. Onions are prepared not one but three ways: raw, sautéed, and deep-fried, and there are seven other veggie toppings to choose from. You also have the option of adding a thick cut of bacon and a fried egg for no additional charge. And we even make our own pickles. The Deluxe is sold at the Grab 'n' Go Marketplace, where I work the dinner shift Sunday through Thursday. Our crew of fearless cooks keeps the food cranking out at a swift rate to feed the neverending line of hungry students. Amid the flurry of hand-dipped fish and chips, savory portobello sandwiches, and action-packed Reubens flying out the order window, the Deluxe remains king. The team has one standard when we send a Deluxe out: "Is this going to put a smile on someone's face?" We know that many of our students are away from home for the first time and a good-looking meal, one that tastes even better, will make the experience easier. The students' enjoyment of our burger was never more prevalent than during the big snowstorm last December. With the campus frozen over and many alternative options closed, our students came in throughout the day, happily surprised to see a team of people working hard to make them whatever their wildest burger dreams desired. 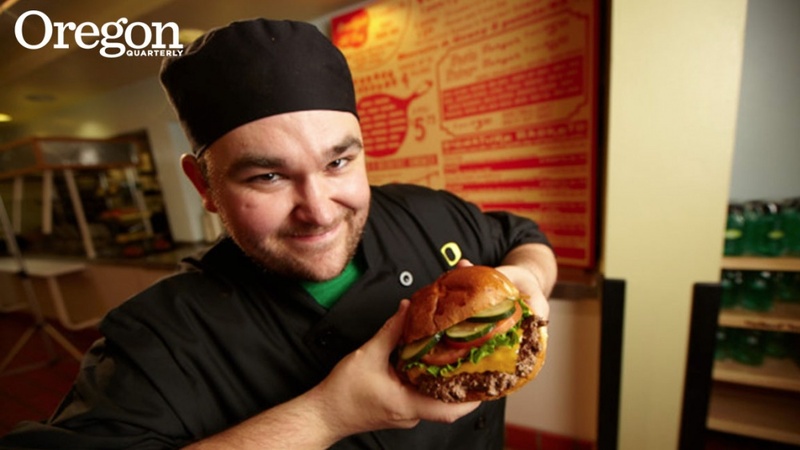 Hamilton dining hall is open to everyone, so the next time you are visiting the UO, come on in and create your own version of the Deluxe Hamburger. It's the best on campus.